23% of Native American families experience low food security, more than any other families in the U.S. The true measure of any helping organization is their impact: are they meeting their mission and making a difference for the people they serve? PWNA is, according to our Partners. Our customers — the people we serve and most directly impact through our work — are our reservation Program Partners. Regardless of a reservation partner’s core focus (nutrition, education, health, etc. ), our main goal is to help improve reservation programs and to help develop local leaders who can drive social change for the reservations. PWNA measures this change through partner-focused outcomes. And these partners in turn work directly with community members on client-focused outcomes such as reducing hunger and disease rates or increasing graduation rates. 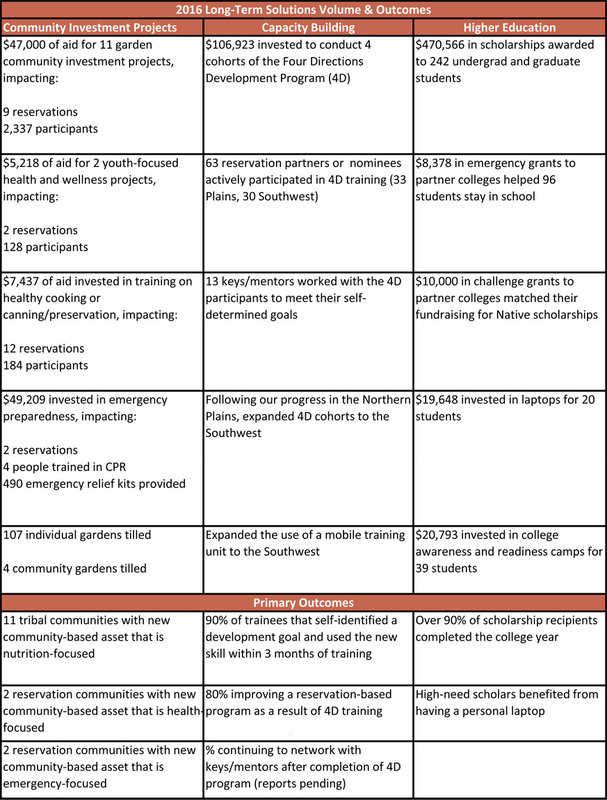 PWNA’s program logic model shows that, as our reservation partners become more effective, they are more likely to create positive impact for their communities. The continued growth of our partners moves us toward our vision of strong, self-sufficient Native American communities. PWNA serves immediate needs and supports long-term solutions on the reservations. To better understand how our work impacts individuals and families, we track the immediate volume and impact of the materials and seasonal services we provide, as well as long-term outcomes. 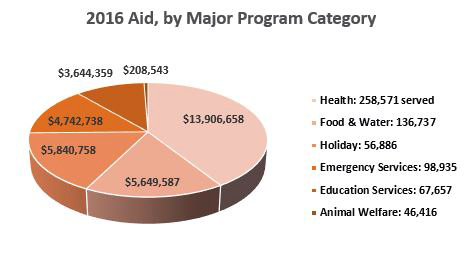 This pie chart shows our volume of service or output for immediate needs in 2016. Through our Material Services partnerships, this aid benefited 250,000 Native Americans living in isolated and underserved communities with the highest need in the United States. Collaborating with our Material Services partners, PWNA provides essential supplies and seasonal services for Northern Plains and Southwest reservations, education and animal welfare. Yet, even while meeting immediate needs through the provision of goods and services, we are also having a long-term impact. This next chart shows the results of anonymous surveys sent to more than 1,000 Material Services partners, about half of whom responded. Our partners clearly report PWNA has a positive impact on them and their ability to better serve their communities. PWNA’s long-term solutions support community-based initiatives led by our reservation partners and other local leaders who are working for sustainable gains in their communities, as well as partner development, capacity building and higher education. Even our newest service offerings are already yielding positive outcomes for partners, participants and communities on the reservations. This chart shows the volume of recent sustainability services and other Long-Term Solutions.